*When you guys filled out my blog survey last month (see results by clicking here--there are pie charts! ), a few of you left comments for post topics you would like to see on this blog. Today's topic of the role that our shared faith plays in Jordan's and my marriage was one of those. I'm linking this post up with Community Brew with Madison & Rachel! 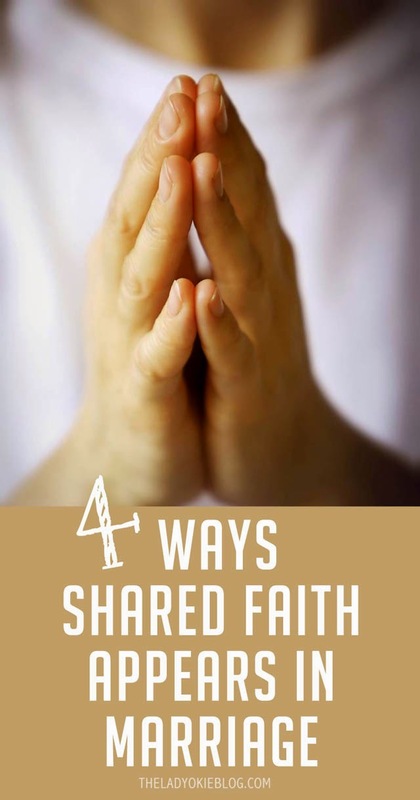 I don't know about you, but I really enjoy reading articles and blog posts on the subject of faith. It's so interesting to me to read about what other people believe and how they came to that belief. If the writer/blogger happens to share my opinions on the subject, I find a kindred spirit. And if they believe something opposite of me, I use that as an opportunity to consider an alternate viewpoint and really solidify the reasons behind why I believe what I do. With that said, marrying someone who was not a believer in Jesus Christ was never an option for me. My faith is such an important part of my life that I could not imagine going through life with someone who didn't feel the same way about faith. Of course, in a marriage there are obviously going to be things we don't agree on, and that's completely normal. The food we like to eat, the hobbies we enjoy, the books we read. All those things are individual desires that Jordan is not always going to love as much as I do. I mean, seriously. I've tried as hard as I can to get him to love avocado. It ain't happenin'. But while Jordan and I definitely don't agree about everything, we do agree about the one thing that counts: the superiority of crunchy peanut butter over creamy. No I'm kidding, the one thing that counts is faith. I promise this sounds a lot more legit than it really is. All I mean is that after church on Sundays or at random points throughout the week, we end up having a discussion about some aspect of faith. We've talked about women's role in the church, our spiritual gifts, evangelism, tithing, homosexuality, God's providence, and many other topics. Because we both have a background of church and weekly study of the Bible either in church or personal devotions, we are able to have interesting conversations and challenge each other by practicing apologetics (a Greek word meaning "defense of the faith"). What's good about sharing the same faith is that while we can have good discussions about these topics, we ultimately agree fundamentally with each other on most things, so the discussions don't end with an argument. Always a good thing in any relationship. Back in January I mentioned my goal of 365 days of prayer for 2014. While I have to be honest and tell you that I definitely haven't been consistent in this every single day, I do pray for Jordan (and for my friends and family), and Jordan and I take time and pray together too. We try to pray every night before bed (even though it doesn't always happen), and when one of us is hurt or feeling stressed, we pray about it together. I love hearing Jordan pray. Parts of last year were extremely difficult for me, specifically working at a job I absolutely hated and then getting fired. Low point. One night in early February 2013, I had a terrible, terrible night. It still stands out as one of my lowest points in my life so far. The next morning when I woke up, Jordan had covered the bathroom mirror from top to bottom with sticky notes, and each had a Bible verse on it. It was one of the sweetest things ever, and it meant so much to me. I still have the stack of notes with verses on them. When I'm feeling sad or overwhelmed, I ask Jordan to pray over me, and he does it right there. I also know he prays for me every day. It's so comforting to know he is doing that. I know there's a lot of controversy over the verse in Ephesians about wives submitting to their husbands [Ephesians 5:22-23 "Wives, submit to your own husbands, as to the Lord. For the husband is the head of the wife, even as Christ is the head of the church."]. I actually read a blog post just the other day about someone who thinks that view is old fashioned, and she said she couldn't understand why the Bible was so degrading of women. The Bible is actually very pro woman, and it is clear in the gospels how much Jesus honors women (one example is how women were the very first to see the tomb and the risen Christ), so I think it's ridiculous when people say the Bible is anti-women. But that's another topic for another day. What this Ephesians verse means to me is that while Jordan and I are yoked together equally as believers in Christ, ultimately I submit to his leadership of our family by trusting that he has been in the Word and communicating with God for guidance. That doesn't mean we don't get into arguments about what we should do about finances or house hunting and those big life decisions, and it does not mean that we always have to do everything Jordan says. But if we had to make a big decisions and it came down to me vs. him, I would submit to his leading. I don't believe that's old fashioned; I believe that is how God ordained marriage to work as a picture of our human relationship with God. Of course, I'm stubborn and sinful so I don't always do this well, but ideally this is how it would look. Hopefully that gives you some insight into how faith appears in our marriage. If you have any topics on faith or marriage that you'd be interested in me writing about, leave a comment or shoot me an email! -Do you think it's important for couples to have a shared faith? -In what ways does your faith present itself in your relationship? Great post. Thanks for writing on this subject. I love that you blog about your faith. We (you and I) don't belong to the same faith, but from what I can tell about you from your blog is that we both have faith in and a love for Christ. I agree with every point here. I believe that praying for each other is hugely important. For one, it keeps some humility in the relationship. And by that I mean it reminds us each day how much we love each other and how much we want for the other to be happy and fulfilled. And besides that, it's just the right thing to do. Praying TOGETHER, bonds us as a couple even deeper. It also gives us the opportunity to pray for our kids together, our concerns as a couple or family, or to just give thanks together. I feel like when we pray together, we are both being submissive to God and trying to seek his will for us. It helps that we hold hands when we do it, or we are snuggling in bed while we pray. We feel close to one another and bonded in our mutual faith. I agree that many people struggle with the idea of submitting to our husbands. The way you explained it was beautiful. I agree 100% with your view on that topic. And I personally love that we have this road map for how to do things in order and wisdom. I absolutely LOVE that my husband and I are equally yoked. I feel that it's the most important part of our relationship. I am thankful each and every day that I am married to someone who has strong faith along with me. I know that God wants us to seek him together, and that he wants us to put him first in our relationships...with him we can accomplish anything. Your husband is very sweet and wise to use your faith to help you. I appreciate that my husband and I can use our faith to help one another. It's so important to us both that we have that in each other. I count that as one of my biggest blessings! Anyhow, great post and thank you for sharing! Thank you so much for your comment! I appreciate your thoughts on this, and I'm glad you liked the post. Jordan and I hold hands when we pray also, and I agree that it does make us feel bonded together. This was such a sweet and honest post, and I love that it was on such a unique subject. Jo and I have been trying to work better on praying together as a couple more often. We enjoy it when we do, and it always lifts our spirits. We just aren't great about being intentional. and love love love discussing apologetics as a couple. I find it to be one of my favorite parts of the week: driving home from church discussing our faith + applications. You definitely do have to be intentional about praying together. We don't do it every single day, even though I would like to. Prayer in general is a very intentional thing, because you have to carve out time to do it and really focus on what you're saying and thinking. It's so easy to get distracted. Shared faith was a given for both of us when it came to romantic relationships, especially when children are brought into the picture. I think it would be extremely difficult to raise children when you have conflict in your faiths (but I know people who do it). As a couple (and now a family), we attend church, do devotions together, and just live life through that lens of faith that we have. This was really interesting to read. I grew up in the Catholic Church, which in my view doesn't really discuss submission at all. The only context I read about it in (and I'm not trying to be derogatory in using this term) is in fundamental "fundie" families. I'm curious what submission looks like I'm a relationship where you both have jobs and don't have children. Interesting! I didn't know that the Catholic Church doesn't really discuss submission... or at least the view you grew up with. I'm sure the concept sounds a bit odd at first, especially if you didn't grow up with that mind-set. You ask an interesting question, and I've been thinking about what submission does look like with a couple (like us) who doesn't have kids. I see submission in many aspects of our marriage so far. In terms of things like what we spend our money on, saving for and eventually buying a house, and even growing our family with eventually having kids. Those are all things we've spent time talking about and praying about. I think where submission comes in is, like another commenter said, I trust that Jordan is seeking God's will in those decisions. Obviously it's important that ANY couple, no matter what faith they have, agree on and make those types of decisions together, but I can feel confident that God is leading Jordan in that first, and then we can pray about it together. I don't know if that even makes sense... Honestly, I still haven't discovered all the submission means or how to do it. I just know that it's something God has called us to, so I need to practice it as much as I can. I think it starts with realizing that it doesn't have to be my way or the highway, and it actually takes some of the anxiety and pressure off of me as we make those types of decisions. I agree that it takes some of the anxiety off of us as wives LOL That's a little side bonus, huh? And I also agree with the comment that we trust our husbands to be seeking God's will. In the end, if we are really struggling to come to an agreement on something fairly big (which doesn't happen too often), I will usually say, "It's your decision to make now. And I support you in that". It's hard sometimes, but because I know he has God's will in mind, in addition to my best welfare, it makes it so doable and comfortable. Does that make sense? Great post, Amanda. I also like it when bloggers talk about their faith. I definitely believe it's important for couples to share the same beliefs. Especially in marriage. I used to think shared faith was one of those things that was something really good, but not absolutely necessary for relationship success. I wanted the guys I dated to be strong Christians and all, but I think my loneliness got the better of me and I convinced myself that as long as a guy was a good and respectable, his walk with God wasn't a deal maker or breaker. Naturally, I got my heart broken by a couple of these guys and eventually made the decision that I was simply not going to settle for men that weren't actively seeking God. Two weeks after making that commitment, I came in contact with a guy like I'd never met before. He was such a committed Christian and was bold about his faith. We became friends and I visited his church a few times. We talked at the campus Christian club meetings every week and we'd sometimes hang out and talk after Sunday night chapel services at our college. Long story short (despite this long comment) we started dating on Christmas Day and I have never felt more at peace about a relationship. I wouldn't trade our Christ-centered relationship for anything and I can't figure out how I could have been so misguided before. I like the theological conversations part of being married to someone who shares the same beliefs too. Especially because we grew up in verrrry different denominations and sometimes we definitely do NOT agree on some points! But at least we can talk about why we disagree repspectfully, and I think it's been a big learning experience hearing about why someone else believes what they do - I think we've both actually found things that we DO agree with that we never would have expected to if we hadn't spent time talking about it! This is great! Shared faith is so important and talking and praying things out has been the biggest help in my marriage. My husband and I are total opposites - artist \ doctor, saver \ spender, health nut \ junk food junkie. I really have no idea how we would agree on anything if we didn't see eye to eye on the role that Christ should have in our lives and more specifically our marriage. I love your comments on submitting to your husband as a spiritual leader too. This is something that we have talked about in depth. It is hard to mesh that view with popular culture, but it is ultimately a great big trust issue, trusting Christ to lead your husband to lead you. I absolutely LOVE what you said "trusting Christ to lead your husband to lead you." YES. This is it exactly. Oh mercy - do we ever get in spiritual 'debates'... if spouses can get in heated arguments about the Bible - no wonder strangers & foreign lands get in fights over it. Submission - its a word people hate, but the Bible calls it. Even harder to do sometimes. Love this post! My hubs and I have had some great discussions about the Bible and I'm always amazed at how much we learn from each other! Oh and I love how you explained submission too. This is great - one of my favorite parts about marriage has been seeing how both of us have grown in our faith and in our relationship with God. Daniel is the type of person who questions everything so it's led to some really great "theological discussions." The best part of my day is definitely praying with Daniel before we go to sleep. I'm so thankful to get to share my life and faith with him. Yes, yes, yes!!! If Nate weren't a Christian our marriage would be crap. So much of our marriage is wrapped up in our faith. Sharing life with someone who agrees on such key factors really does matter! Wow! Thanks so much for sharing. This was really interesting. I think it's a huge blessing that this worked out this way for both of you, and that really makes me so happy! God was obviously working in your relationship even before you knew it. I don't think I know many people who have a story quite like this. Obviously it can happen, but it's probably rare, I would think, that both of you were ready to grow so much in your faith together. Very cool! THE single most important thing for me before I will even consider getting into a relationship is faith...It may mean that I stay single for a while (or forever), but if we do not have faith in common, then our relationship won't be worth a thing. My faith makes me who I am. Every relationship (even family ones) problem comes from a difference in faith...It is just too important to me! Great post, Amanda. Eric and I have been reading "The Meaning of Marriage" by Tim Keller together. Have you read it? It is fantastic, and his explanation of the biblical roles in marriage is really good. I am so thankful that God gave us marriage as a picture of Christ's love for the Church. All Christians submit to authority, not just women! The roles of marriage simply depict the roles of Christ and the church. And what a beautiful (sanctifying) picture it is. This is what I definitely desire in my (extremely distant) marriage! I love when couples can pray together. That' something that is uncompromisable to me in a relationship. Also, the fact that Jordan covered the bathroom mirror in Bible verses literally just made me "awww!" That is so great! One of my first memories of Angel is of getting into theological discussions with him about predestination and free will...his first introduction to Protestant Christianity was the Christian Reformed church while I'm a little more like a pentecostal Methodist so that's probably the most famous difference between Calvinism vs. Arminianism. We read the Bible and pray together when we can, and recently we've been listening to sermon podcasts from Angel's favorite preacher, Ravi Zacharias. I grew up in a family where there were always lively theological discussions around the dinner table (just two nights ago I was talking about legalism and evangelism with my Mom on Skype) so I'm glad our kids will also be raised in a family where it's considered awesome to talk about what we believe and why. WHOA DEEP SCARY THOUGHTS EEK. Anyway, I guess I don't think about how faith appears in our relationship because it's just there. I take it for granted maybe sometimes. It was good to have a chance to think about how it appears in our marriage. I always have theological discussions with my husband--we even met at church. I do think we tend to underestimate the power of praying for each other in our daily lives! When I first got married I was hard headed and thought I was going to do this my way or now way. It wasn’t until one of my friends introduced me to “Created to Be his Help Meat”. This book completely changed how I viewed marriage. One of the biggest things was submitting and letting him be the leader. If you want a life changing book I highly suggest this. It really helped mine! I think for us it appears in our marriage in the form of discussions, faith-based community, giving, and love for each other and for others, all of which we could do better at. Forgiveness and grace are modeled for us by Christ, but I know I so often fall short of his example. Interesting topic! My husband and I are an interfaith couple. In some ways, it's a non-issue. I don't think about it day-to-day. We are fortunate that because of how we were raised, our beliefs don't conflict. His family celebrated Christmas growing up even though they are Jewish. (I know some Jews feel understandably very strongly against this, though.) I'm pretty open-minded about Judaism. Since it's essentially the old testament, it doesn't feel uncomfortable for me to join in. I have fallen in love with the tradition and beauty of the religion. We were married by an interfaith rabbi, we always light our Hanukkah candles, and we attend Passover whenever it's possible. Getting a peek into Judaism has only helped me grow in my own faith. I think what I loved the most is that you honored Jesus and Jordan through this post. It's so easy to focus on the annoying things but I loved that you highlighted that Jordan prays over you and left you lots of sticky notes with verses. I feel really blessed, and I think you probably do too, that we both have godly Christian men. I don't deserve it but I'm so thankful! For me, it was also essential to be married to someone who shared my faith. Everything in my life is based around my love for Jesus. If my spouse could not relate to that, we would have very little in common. This is such a great post and really a great tool for someone who's wondering why it matters to be of the same faith. I can't imagine how difficult it would be to see eye to eye on things if we had different faith backgrounds. Thanks for linking up with us! I do think it's important for couples to have a shared faith -- in the sense that they both believe in the same morals, ethics, life beliefs, and right/wrong. My guy + I talk about faith a lot and I've been teaching him how to pray more gracefully. Even though our labelled "religions" are different, our faith is the same + it's been a really great aspect of life to grow together in! I love everything about this post, Amanda! I love what you shared about Jordan filling your mirror with sticky notes with verses on them. How sweet, thoughtful, and loving of him! This is the first post on faith I have read. It is interesting to hear how a couple incorporate faith into their lives together. You have inspired me to write a post about my own faith. I definitely believe faith is important in life; whether it be spiritual or religious. And we are so with you guys on the theological discussions as well! I could have written the exact paragraph you wrote up there under #1! It's something I really love about our relationship. It helps both of us grow in maturity and in our faith.